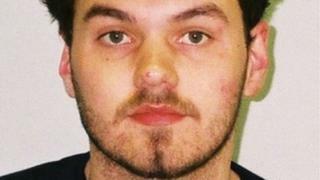 A man who killed a girl by hanging her at his parents' house has lost his appeal against his whole-life sentence. Jamie Reynolds, 23, was told he would spend the rest of his life behind bars when he was sentenced in May for the murder of 17-year-old Georgia Williams. Reynolds was described as a "sexual deviant" with a "morbid fascination" with depictions of extreme violence, and as a potential serial killer. Georgia went missing from her home in Wellington, Shropshire on 26 May 2013. The Court of Appeal ruled there was "no basis on which it can properly be argued that a whole-life order was not required". The whole-life tariff handed out when Reynolds received a mandatory life sentence for the "horrific" murder was "just", said Lord Chief Justice Thomas. Georgia's body was found in woodland off the Nant-y-Garth pass, near Wrexham, four days after she went missing. Reynolds had hanged the teenager in a sexually motivated attack in Wellington before dumping her body. Giving his reaction to the Court of Appeal's ruling, Georgia's father Steve Williams said there was "no punishment severe enough". "I hope he serves life in prison until his last dying second - that's me speaking as a dad," he said.